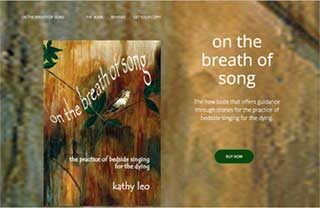 OnTheBreathofSong.com is a one page site to promote a book by our local hospice choir director, Kathy Leo. I’d worked with her before on the site for the choir Hallowell, but now she needed a simple site for the book so that people would be able to find it online and order copies of the book. This is a static html site that works well for her. It is fast loading, and not overwhelming. Linked from the popular Hallowell site, or found by direct search by other hospice choir singers, directors, or folks wanting to know about starting up a hospice choir to sing for the dying.